We do not “rescue” stray dogs or dogs from abusive or neglectful situations without the owner’s permission. That is Animal Control's job; we will only deal with the dog's legal owner. If you know of a German Shepherd or any dog that is straying at large or is being abused or neglected, you should report it to your local Animal Control. We get the majority of our dogs from our local pounds and shelters, if you notify us that you've turned a dog in, we will be sure to take a look at the dog and see if it's suitable for our program. If you are an independent rescuer or a good Samaritan who has taken in a stray dog, you must have completed your county's due diligence requirements to become the legal owner before we can help. Contact your local county or city for due diligence requirements. * Rescue Groups such as ours with a Courtesy Listings section. We have provided this service for those people who wish to rehome their own dogs, or for dogs that we can't take into our program. Owners can list their purebred German Shepherd or mostly-GSD mix with us for 90 days for $25 and need to supply proof of spay/neuter and current vaccination before we will list them. We discourage offering dogs for free, so owners should ask for a small rehoming fee. If you are giving up your dog because of behavior issues, please seek the help of a professional trainer first. No one cares as much about your dog as you do, and you are responsible for your dog's behavior, health and welfare. Behavior problems can often be solved with the right training. We suggest going to The International Association of Dog Professionals and looking for help under Find A Professional. If the dog is not spayed/neutered and vaccinated before surrender, we require a surrender fee to help cover those costs, and we ask for a surrender fee for all dogs to help offset our costs. We are not tax-subsidized like government shelters or pounds, we must pay for all our veterinary work, food, board, etc. Foster homes are at a premium, and our mission is to save purebred German Shepherd Dogs; therefore, we rarely take German Shepherd mixes. There are just too many purebred German Shepherds in need of homes, and there are too many mixes, we're very sorry but we can't help them all. 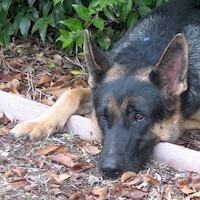 We will evaluate your dog's temperament before bringing the dog into our program. This means that we will test your dog to see how safe your dog is while being handled by a stranger. This will be the same evaluation we do to dogs in a shelter setting, and it means we'll take the dog from you and put a chain slip collar on your dog for our own safety. We will subject your dog to a variety of stressors and triggers to see how tolerant your dog is without actually hurting the dog. We will only take dogs that have social attraction to people and that we feel are safe for us to take into our own homes with our own dogs and children. If you have any reservations about this test, or if the dog has an injury that may prevent an evaluation, then we can't take your dog.